I went to a game at Fort Wayne’s Parkview Field for the first time Sunday, and I was impressed by the ballpark. There’s a lot to like about it, from the variety of reasonably-priced food and drinks to the “not a bad seat in the house” sightlines throughout the stadium. 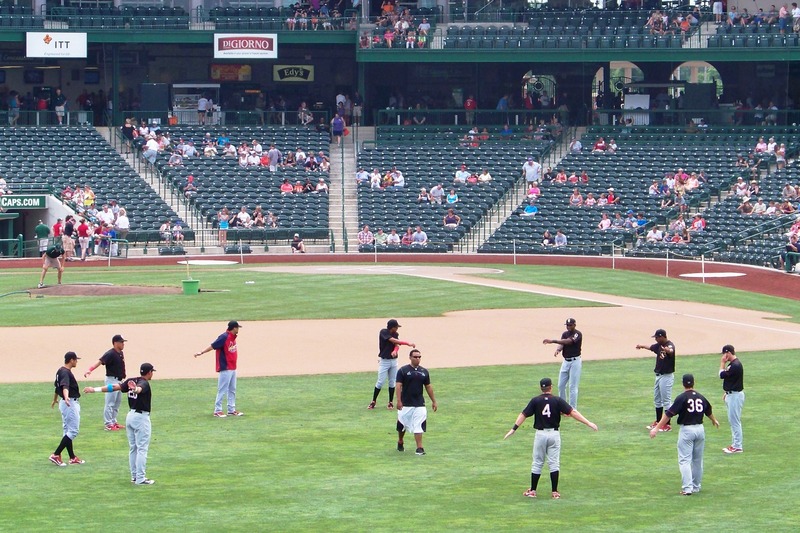 Quad Cities River Bandits players loosen up before Sunday's game. … and others stand around on the field. "Why are there four gloves but only three of us?" "I told you we should've written our names on them!" After eating the pretzel, I walked over to the Center Field Grill, where the food for sale includes a quarter-rack of ribs and grilled chicken. I ordered the ribs because most ballparks do not offer them; of the 10 Midwest League ballparks I’ve visited, Cooley Law School Stadium (home of the Lansing Lugnuts) is the only other one where I saw ribs for sale. A couple innings into the game, I moved to a seat on the first-base side of the field. It turns out I picked almost the perfect spot, as I came very close to getting a free T-shirt. The shirt landed in the row in front of me (where no one was sitting), but as I reached down to pick it up, a kid came out of nowhere to swat it away from me before picking it up for himself. That was too bad, considering I actually would’ve worn the T-shirt, whereas it surely is too big for the kid to wear. Oh well. At that point — the end of the 4th inning — the game was tied 1-1 thanks to a home run by Quad Cities CF Oscar Taveras and an RBI single by Fort Wayne LF Luis Domoromo. TinCaps LF Luis Domoromo stands on first base after singling home RF Rymer Liriano. The River Bandits first baseman is Jonathan Rodriguez. The top of the 5th inning meant it was time for my ballpark tour to begin. 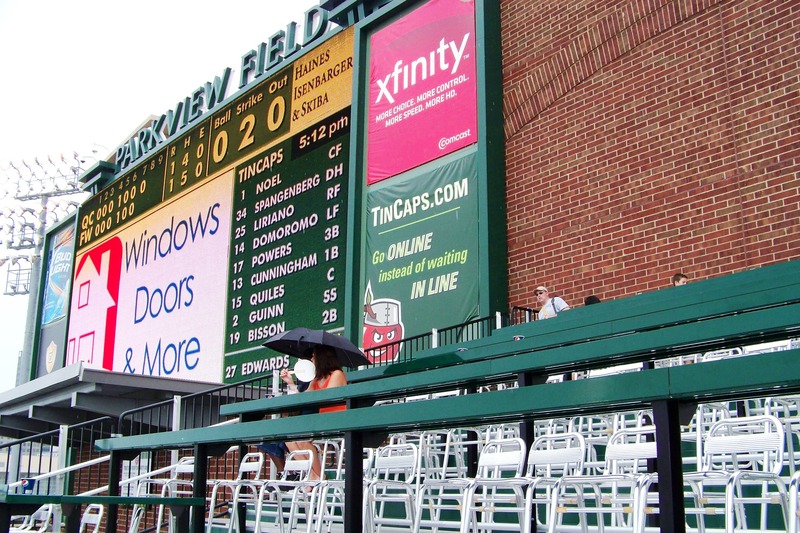 Michael Limmer, vice president of marketing and promotions for the TinCaps, took me and a family of three (the son is an aspiring sports reporter who wanted to see the press box) to various points of interest throughout the stadium. 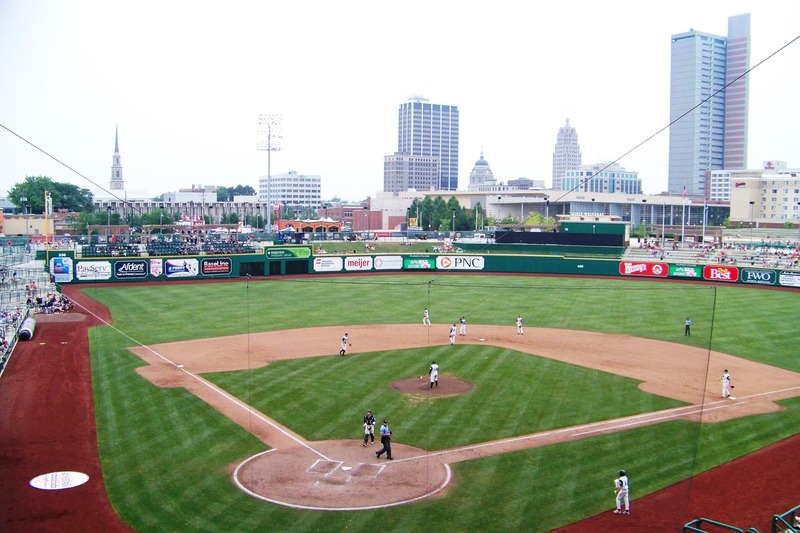 The view from the Parkview Field suites includes downtown Fort Wayne buildings seen beyond the ballpark. We got to see the batting and pitching cages used by players. For only $1, kids can use the same cages during the game! We also got to see The Treetops, which is an outfield party deck modeled on the rooftops across from Wrigley Field. It is located above the rightfield concourse and below the scoreboard. 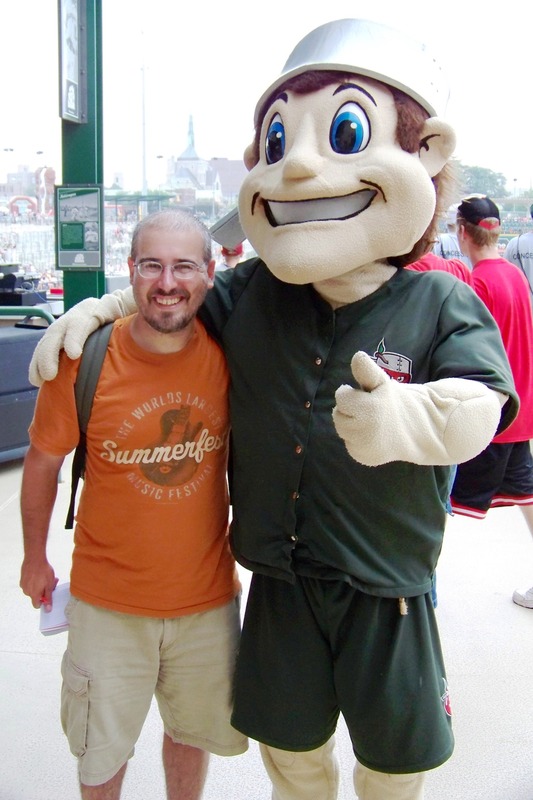 I also got to meet Johnny, the TinCaps mascot. He is modeled after Johnny Appleseed, who died and is buried in Fort Wayne. The TinCaps play off the legend of Johnny Appleseed quite well, which I’ll write more about in my next post about Parkview Field. As for the game, the TinCaps beat the River Bandits 2-1. 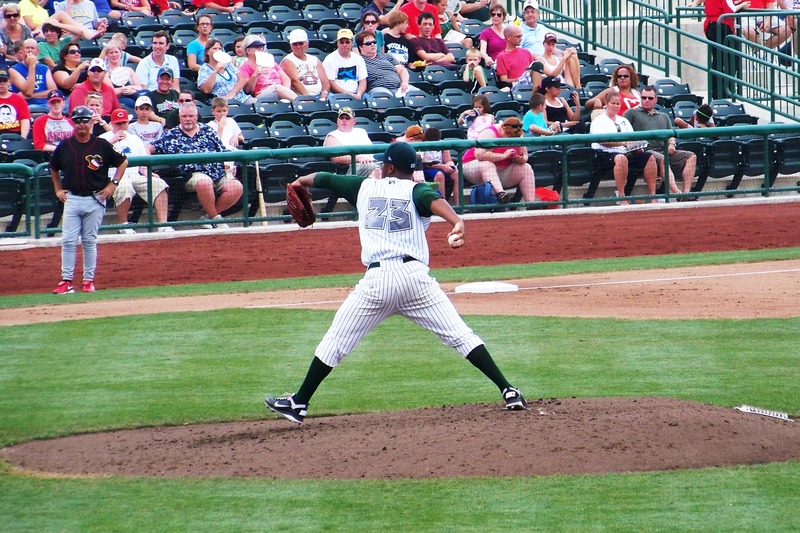 TinCaps starting pitcher Keyvius Sampson, who pitched in this year’s Midwest League All-Star Game, allowed just one run on three hits while striking out five batters in five innings. River Bandits starting pitcher Boone Whiting threw a good game, too, allowing just one run on five hits while striking out four batters in six innings. 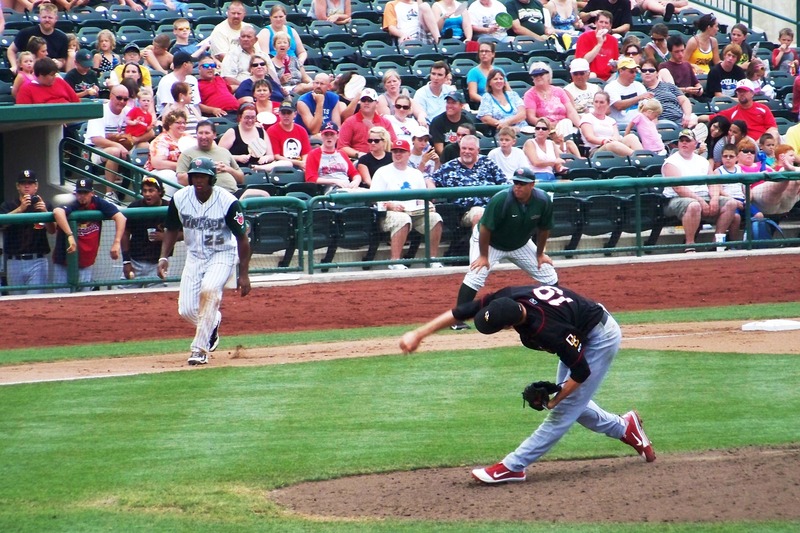 The TinCaps scored the winning run off the River Bandits bullpen in the 7th inning. TinCaps RF Rymer Liriano takes a lead off third base as River Bandits SP Boone Whiting delivers a pitch. 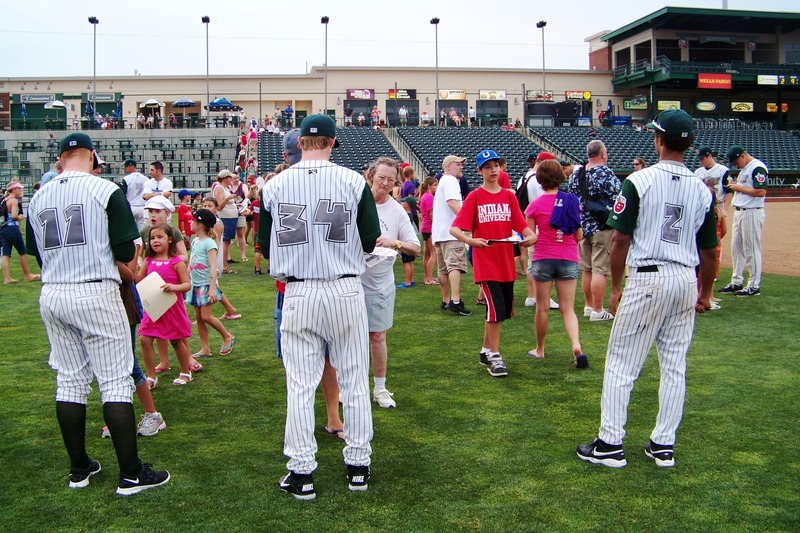 After the game, kids could run the bases (a Sunday tradition in the minor leagues) and fans of all ages could get autographs from TinCaps players on the field. 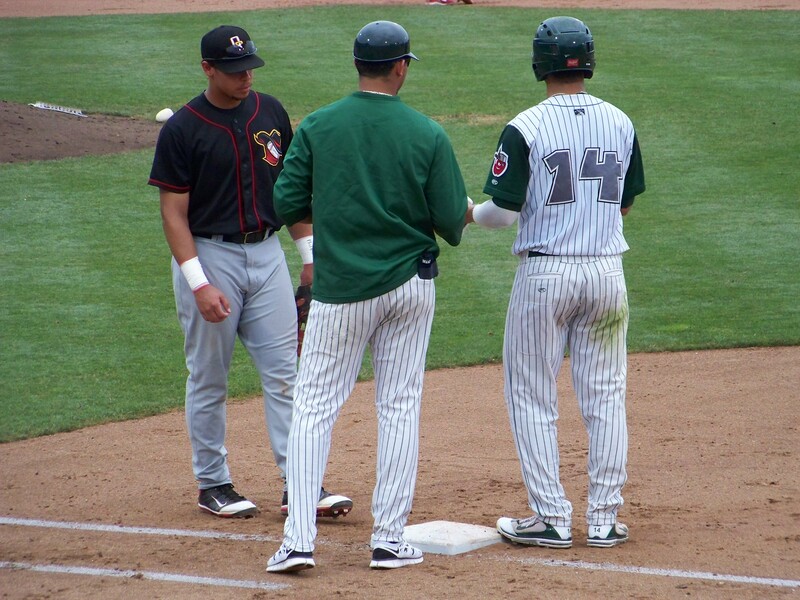 TinCaps players, including (from left to right) P Chris Franklin, 2B Cory Spangenberg and SS B.J. Guinn, signed autographs for fans after the game. I’ll be back at Parkview Field for another TinCaps game tonight. As part of the Principal Financial Dreams Tour — The Principal Financial Group is a sponsor of the TinCaps — 1978 NL MVP Dave Parker will be on hand to meet fans. The game starts at 7:05 p.m. and will feature a pitching matchup between LHP Todd Privett (1-0, 2.61 ERA) for the TinCaps and LHP Anthony Ferrara (8-5, 3.08 ERA) for the River Bandits. This entry was posted in Fort Wayne TinCaps, Lansing Lugnuts, Midwest League, Quad Cities River Bandits. Bookmark the permalink. Thanks for sharing. Cool to see so many familiar sights! Glad you enjoyed, and have fun again tonight. Thanks, Malcolm. I knew I would enjoy Parkview Field after reading about your great experience there. I plan to try the apple crisp tonight, per your suggestion. Incidentally, the Edy’s rainbow sherbet ice cream I ate there yesterday was out of this world! I live in Fort Wayne and loved reading your story about the field. Always nice to get another perspective. Also just so you know the Tincaps allow kids to run the bases after every game and Sundays are always autograph day after every game. The font for the numbers on the back of the Tincaps’ jerseys are just awful. Wow! 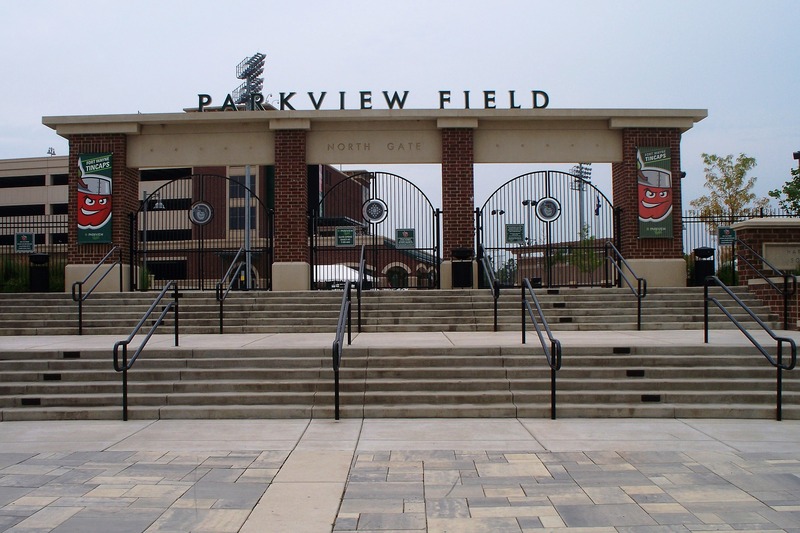 Very nice article that sheds a positive and honest light on Parkview Field. It was money well spent on beautiful downtown Fort Wayne and I adore going to the games with my Dad and my Son. 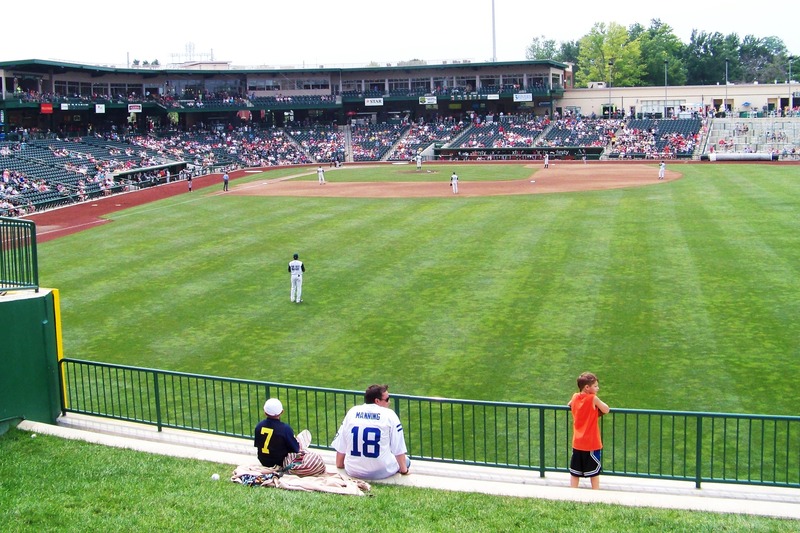 It’s rated tops in Minor League baseball parks for a reason and your thoughts on it were great. Thanks for sharing with us!! Good luck with the book! !